Since we were doing back-to-back cruises, we had a turn-aroun d day in Amsterdam we visited the Riksmuseum and drank in the beauty of the Rembrandt masterpieces I studied in art history books in school. New passengers boarded our ship and we sailed for Scandinavia, arriving in Stockholm, Sweden, after a day at sea. To our de light, we could see from our ship the hop on-hop off boats that Dave from Friends of Dave, had told us about. It was a lot more fun to take a canal boat than the shuttle bus that was offered. Our ticket allowed us to get off and on at several stops that were conveniently located near the primary tourist sites. After taking an hour tour around the city by boat, we stayed on for two more stops a nd exited near the Royal Palace in time to secure a prime viewing spot for the changing of the guard. At 12:14 p.m., the Royal Guards unit marched into the courtyard from the obelisk accompanied by a military band. The ceremony then began at exactly 12:15. With precision, the guards navigated through the ceremonial change. They marched to each guard station and exchanged orders as the old guard was replaced by the new. After the total exchange was made, we enjoyed the musical presentation of the military band complete with marching band maneuvers. It may not have been on as large a scale as the Buckingham Palace guard, but it was certainly an impressive presentation. Hungry, we made o ur way to a market area where we happened upon a gourmet hot dog stand. We ordered a special with no idea what we were getting. 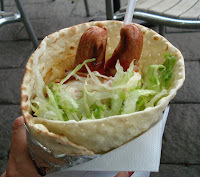 It turned out to be a large tortilla wrapped around two hot dogs and stuffed with mashed potatoes and lettuce with a special sauce. Good but way too much to eat. Sweden is made up of many islands and as we sailed away fr om Stockholm, we passed evergreened shores of pines and firs on tiny islands dotted with simple houses and cabins that looked like serene getaways from the city. Another lovely sunset ended our evening. As each day drew to a close, we grew to anticipate sunsets that painted the skies with promise for another day of adventure to come.